How do we know what would make a difference in the healthcare of local people? 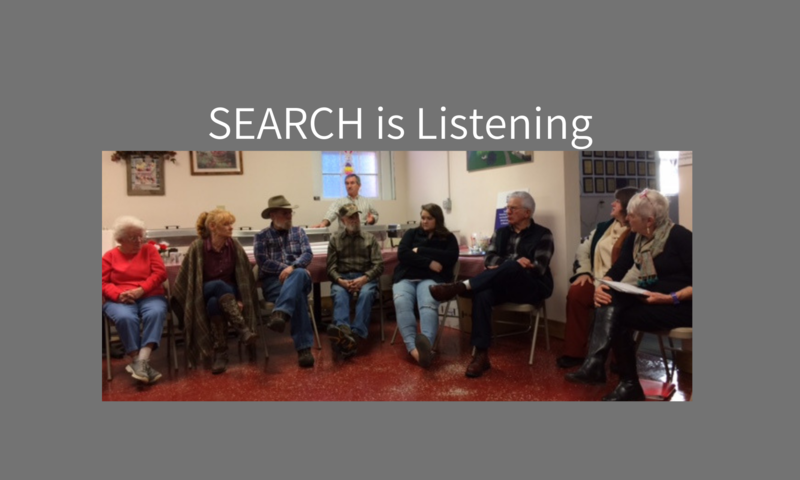 Best way is to ask them directly, and that is what the Outreach members of SEARCH (Sustaining Essential and Rural Community Healthcare) have been doing in Yancey and Mitchell counties. They have been conducting Listening Sessions to hear the experiences, the needs of families and communities and the ideas and hopes that can inform the decisions made about healthcare in our region. Team members have met with over 115 people in churches, community centers, in fire departments, at nonprofits and schools to ask simple questions such as what are the strengths in our local health care? What do you wish were available in health care that would help your friends and family? What kind of issues are your friends and family dealing with? The sessions last about an hour and often are scheduled through a presentation to an umbrella group, such as the Yancey County Fire Chiefs or the Mitchell County Board of Commissioners. The information is written down as it is spoken and then organized under two categories, essential services and social determinants of health. This will be made available to organizations that can develop programs or services and apply for funding to meet the needs expressed by residents. It can also be helpful to board members of the Dogwood Health Trust and AMY Wellness Foundation as they shape their priorities of funding. Last Year the Toe River Health Department, in conjunction with Blue Ridge Regional Hospital, conducted the Community Health Assessments. The results of SEARCH’s in-person sessions are meant to complement the assessments, which were conducted in both counties by the compilation of data and through extensive telephone interviews. Because both the Dogwood Health Trust and the AMY Wellness Foundation will focus on the Social Determinants of Health, a goal is to hear about the factors which prevent people from being as healthy as they can be. For example, in a recent Listening Session at Tipton Hill Community Center, some of the topics that were discussed were the need for dental care, the desire to have a doctor or PA come to their community on a regular basis, the long distance to any hospital, the uncertainty of ambulance availability when needed and the need to travel longs distances to find work. The Listening Sessions will continue through 2019. Communities wishing to schedule one can contact Karin Rolett at karin.rolett@gmail.com. SEARCH meets most months, alternating between Burnsville and Spruce Pine. The next meeting will be at 7:00pm on Tuesday, April 23, at Trinity Episcopal Church, 15 Hemlock Avenue, Spruce Pine. It is open to anyone who’s interested in ensuring that the citizens of Mitchell and Yancey counties have access to safe, quality, affordable and local healthcare. For more information visit the website: searchwnc.org or Facebook page: S E A R C H wnc. This article was originally published in the April edition of the Blue Ridge Christian News.